So go look at In Case You Missed It before you read this post. If you’re reading this, chances are good that you have seen the phrase “in case you missed it” over and over again on Twitter and Facebook. The phrase only makes sense in the fast moving world of contemporary social media. If you post a link to something at noon, by five o’clock, unless it has been retweeted or shared throughout the day, it has faded into the mists of social media time. “In case you missed it” is a way of fighting the information tides–it allows you post repost that link hours later in order to drive traffic to it. But there is also a second face to “in case you missed it.” This face is false-apologetic. It is a face that suggests that we’re always extending a courtesy, that we’re just posting the article in case you missed it, like it somehow slipped through the view of the random twitter reader. This is interpersonal spam with an apologetic face. Nothing shows this more clearly than the number of actual spam posts that use the phrase “in case you missed it.” Twitter ads for toys, corporations, nonprofits, and nearly every other advertising space litter their tweets with “in case you missed it.” With it, they are doing the same masking that I do when I give the pretense of courtesy to my linkspam tweets–they want to wear a different kind of face. The mask, in the case of spambots, is the mask of humanity. A common courtesy extended by a nonhuman is equal to a common courtesy extended by a human–we’re all apologetic, we all just want to help one another out with the spread of information that might be useful or helpful. For the bot, spreading these sweet deals on Legos is necessary for its continued existence. After all, it exists only to do that. How different is that from the human, though? Does the gift of linkspam for the human twitter user imbue a meaning to the life of that giver? There is something to say about the lure of metrics and people viewing and engaging your work–it can become a driving force behind internet writing. 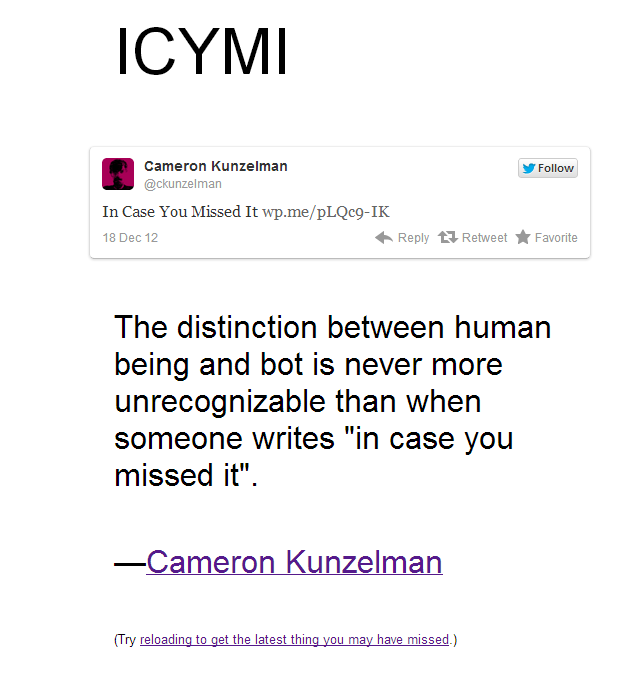 The distinction between human being and bot is never more unrecognizable than when someone writes “in case you missed it”. He, because he is an amazing person, immediately took it upon himself to create In Case You Missed It. It, as I understand, searches twitter for the most recent usage of the phrase “in case you missed it” and displays that tweet. It updates in real time, and refreshing the page gives you the most recent result. The line between human and bot collapses–without the context of the full twitter feed, it is often impossible to tell which tweets are by complete spam bots and which are about self-promoting (or friend-promoting) human twitter users. It is pretty amazing. I also want to note another tool that does a similar thing–Joel McCoy‘s Twitgnostic. It is an extension for Chrome that strips all of the information that Twitter would normally give you. It turns each user into mere words and language, rather than a specific being with a specific goal in their communication. It is brilliant. I have been told that Twitgnostic makes me indistinguishable from horse_ebooks sometimes. This entry was posted in Theory and tagged bots, in case you missed it, nonhumans, theory. Bookmark the permalink. One (perhaps minor) aspect of ICYMI you have not mentioned is timezones. As I writer based in Australia but whose audience is primarily online, it makes sense for me to link my stuff both in the morning and the evening local time to alert my potential audience various timezones as they wake up. This is certainly related to the fast paced social media etc, but is also a specific thing worth considering in the phenomena, I think. Urgh. Somehow I totally missed that nod. Sorry, it’s early. If I punished you for skimming, I would have to punish everyone for skimming.